Successful companies develop a mission statement that outlines their corporate culture, their strengths and their goals. Increasingly, families are developing their own mission statements to define who they are as a family, their values and their goals. As every family knows, life can get hectic. Too often, you make decisions in a hurry, and you might not think about how those decisions serve to advance a long-term family plan. But creating a family mission statement can help family members understand and commit to a plan, or at least to a system of values and priorities. Your family mission statement can be as complex or as simple as you like. You can include everyone in the family in the discussion, or you can develop a mission statement with only you and your spouse. What adjectives describe our family? What attributes – loyalty, ambition, compassion, etc. – do we value? What else – faith, education, community, government – really matters to us? Be honest, and be realistic. Although you might care about your church, your school and your community, which do you care about most? Where are you most likely to put your time and your effort? Next, examine your attitudes about money and possessions. For example, do you want to create lasting wealth that you can pass down to generations? What kind of example do you want to set for your children about money? What things are important for you to spend money on – your home, travel, education, charity? Finally, consider your goals as a family, and think about things that might keep you from realizing those goals. For example, if one of your goals is to make time for your children, does your current work schedule make that impossible? Or if one of your goals is to help each family member follow his or her dreams, how are you supporting your son’s dream to be an artist and your daughter’s dream to be a doctor? During your discussions, you should arrive at some consensus on these and any other issues you choose to include. Then, write down the results of your discussion. Your mission statement can be long and detailed, or it can be very brief. But it should include information on your strengths and attributes as a family, your values and your goals. 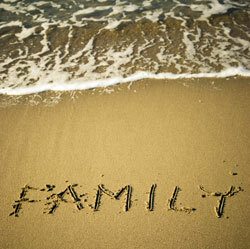 You can update your family mission statement periodically, especially if your situation changes. For example, if you develop a family mission statement when your children are living at home, you might want to revisit it once you become empty-nesters. But you also should refer to your family mission statement regularly, to give you guidance as you face the many decisions life throws at you. It can be a reminder of what is really important to you as a family.